It is never a good time to break down. It is always a pain in the neck. In a pinch, you may need to tow a vehicle yourself. My recommendation is that you call a tow company whenever possible. AST Towing provides all kinds of towing services all around the Albany New York area. 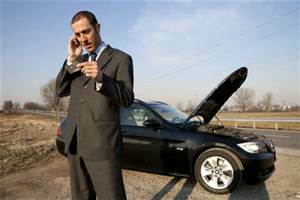 When calling a professional towing organization is not possible, then it is good to know how to tow a car yourself. It may seem a little scary, but it you follow our guidelines, you should be okay. Any car that is going to be towed, must have a sign in the rear window clearly displayed that says ON TOW. 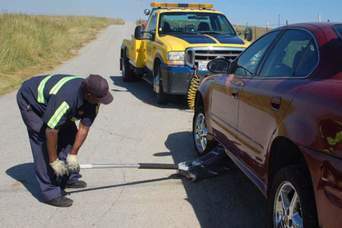 It is necessary to have proper towing ropes or towing poles before attempting to tow a vehicle. Make sure that you do a thorough examination of the tow rope and/ or tow pole to make sure it is in good shape. It should not have any signs of defect. If you find any damage at all on the tow rope or the tow pole, then do not use them to tow the vehicle. The car being towed should have the keys in the ignition and set to the “on” position. This will disengage the steering lock. If the engine is not running, then the car being towed will require more strength to turn the steering wheel. When towing a car to safety, it is important to take great care. The maximum speed for towing is 17 miles per hour. At this speed, it allows the car being towed enough time to react should something happen. The lead car must pull away gently to prevented extreme jerking that could cause the rope to break. The jerking can be abrasive to the cars, as well as the passengers. When needing to break, it is important for the lead car to tap on the breaks so the driver in the car being towed sees your intent to brake and is prepared to apply the break themselves. The tapping of the brakes provides the warning that the driver in the rear car will need. Whenever possible, try to indicate your intentions with early signal indicators. Giving the driver in the towed vehicle as much information as possible so they can be respond accordingly. It is important to not make any drastic maneuvers or extreme change in directions. The two drivers need to try and be like synchronized swimmers. Every action creates a reaction from the car being towed. Maintaining tension on the tow rope will minimize the amount of jerking that you may experience. The tow rope will stay intact when it does not come into contact with the road surface too often. If following these basic procedures, then you should be able to tow a car in an emergency situation. If at all possible, contact companies like AST Towing to keep yourself safe. Tow companies run into the same dangers as policeman that come onto an accident scene. Professional Tow companies know how to be safe conducting a tow in and through traffic.